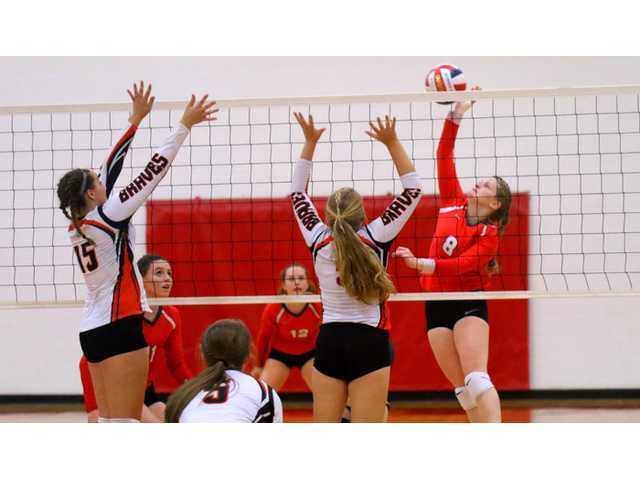 POSTED October 12, 2018 11:10 a.m.
SHULLSBURG — After surviving a close call in the opening set, the Shullsburg Miners rolled to two more victories to sweep the match and the season series from the Belmont Braves in Six Rivers West volleyball action at SHS on Thursday, Oct. 4. The teams locked up in a seesaw battle in set one, swapping the lead eight times before the Miners (9-12 overall, 6-4 SRW) pulled into the lead to stay at 24-23 on a missed served by the Braves (7-15, 3-7). Anna Wiegel followed with a game-winning kill to seal a 25-23 win for Shullsburg. Maggie Gleason got the Miners off to a fast start in set two, serving up the first seven points to thrust the hosts out to an early lead. Belmont never got closer than six the rest of the set as the Miners went ahead 2-0 with a 25-13 win. Gleason closed out the decision with a game-ending kill. Gleason was at it again at the service line early in set three. Following a sideout to open the set, the senior served up five straight points to run the Miners’ lead to 6-0. Calli Jerry extended Shullsburg’s advantage to 17-5 with a four-point run at the service line; and then, after swapping sideouts, Layla Alt served up the final seven points to secure the sweep with a 25-6 win. Kayla Klotz led Shullsburg with eight kills and six blocks. Wiegel chipped in with six kills and Gleason added four kills and 11 digs. Alt handed out 13 assists, while Joleeza Rice tallied 11 digs for the Miners. Lizzy Haag recorded five kills and 13 digs to lead the Braves. Nicole Knebel contributed three kills, seven assists and an ace, while Callie Wiegel had 16 digs. Both the Miners and the Braves opened the week with losses to the league leaders. Shullsburg was swept 10-25, 15-25, 14-25, by the #3-ranked and SRW-leading River Ridge Timberwolves (10-0) at Patch Grove on Tuesday, Oct. 2, while the Braves were swept 13-25, 22-25, 14-25, by the #8-ranked Benton Zephyrs (9-1) at home on Tuesday evening. “Our match against Ridge was tough. For a team that has only lost one set on the entire season, we knew it was going to be a challenge and we just weren’t able to overcome the challenge. Ridge has some tremendous players,” commented Coach Pick. Shullsburg closes the regular season hosting Highland (6-4) in their SRW finale on Thursday, Oct. 11, while Belmont ends the season at Cassville (1-9) on Thursday evening. The WIAA Division 4 tournament begins on Tuesday, Oct. 16, with regional quarterfinal games. The brackets were not released by press time. Belmont Leaders– Kills: Lizzy Haag 5, Elsie de Haan 3, Nicole Knebel 3. Blocks: Ricca Varvil 1. Assists: N. Knebel 7, Ashley Knebel 3. Aces: N. Knebel 1, Sadie Willborn 1. Digs: Callie Wiegel 16, Haag 13. Shullsburg Leaders– Kills: Kayla Klotz 8, Anna Wiegel 6, Maggie Gleason 4. Blocks: Klotz 6. Assists: Layla Alt 13. Aces: Ella Reilly 1, Joleeza Rice 1, Alt 1, Wiegel 1. Digs: Rice 11, Gleason 11. Shullsburg Leaders– Kills: Calli Jerry 5, Layla Alt 5. Blocks: Kayla Klotz 4, Kylie Ubersox 2. Assists: Alt 16. Aces: Anna Wiegel 1. Digs: Maggie Gleason 10, Jerry 10. Belmont Leaders– Kills: Elsie de Haan 6, Lizzy Haag 4. Blocks: Mackenzie Shellnut 1. Assists: Ashley Knebel 5, Nicole Knebel 4. Aces: Cassidy Caley 2, Sadie Willborn 4. Digs: Callie Wiegel 4, Haag 4. Belmont Results: Fennimore def. Belmont, 25-21, 25-16; Wauzeka-Steuben def. Belmont, 25-16, 27-26; Viroqua def. Belmont, 9-21, 27-25.